Networking, News and Entertainment. Join Our Investor Group! MonkyTalk.com is a new social network that is giving people a public voice online without saying exactly who you are. People here can communicate freely with other members and not give out email addresses, skype id's and other personal information that is easily abused. With close to half a million members and growing fast we are looking for people like you to manage growth potential in your city or town. Start Your Own Independent News Franchise In Your City Or Town. Outlets are yours to run. We just do the tech stuff and sales. That's right, your MonkyTalk News Outlet will be yours to run. You will have complete editorial freedom. We will manage the advertising side of the business for you. Franchisee returns start at 15% of your monthly fee and increase by 5% each month to a maximum of 300%. After three years you will be making three times as much as you pay each month. That's a great deal! As the franchise owner you'll be able to put together your own news team to report local news, weather, entertainment, tourist info and more. Your team will be made up of monkytalk members so if you have people in mind have them join as members in your city and send you an online application. That is all there is to it. You provide daily content and leave everything else to us. 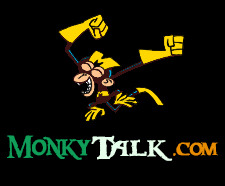 Promote MonkyTalk.com In Your Local City/Town Your job will be to encourage new memberships in your city. Growing your local membership is what will add value to your franchise and increase your earning potential. The more local members you have - the easier it will be to target other local business to purchase online advertising. Act As Moderator Franchise owners will be given moderator authorization and will be responsible for ensuring that members are following MonkyTalk.com guidelines and policies for use of the MonkyTalk.com network accordingly. Get Yours Now Before It's Gone!